Review posted June 11, 2016. Timber Press, Portland, Oregon, 2015. 307 pages. Back in 1999, my family and I got to visit Ashdown Forest and play Poohsticks at the original bridge, so I was delighted when I learned that someone had written a book about the place where A. A. Milne lived and where the real Christopher Robin played, the sites made famous in Winnie-the-Pooh. This book is filled with photographs, which makes it especially wonderful. The author starts by telling the life stories of Alan Alexander Milne and Ernest Howard Shepard and how they came to collaborate. Milne had a childhood rich in experiences of wandering the outdoors, and provided the same for his son. Telling about his life shines light on the stories he later chose to tell. For Milne, warm early memories of roaming the natural world with his brother Ken inspired him to create the setting for what would arguably become the greatest children’s books of the twentieth century, touching generations, selling millions of copies, and being translated into dozens of languages. The books were richly inspired by his adventures with Ken and reflect themes of freedom, adventure, friendship, and cooperation. 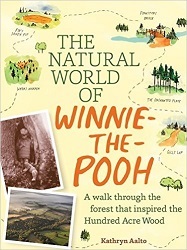 When Milne wrote about the Hundred Acre Wood, it was a way to revisit his own golden memories, as we shall soon find out. Milne and Shepard had an unusually involved collaboration, and Milne shared royalties with Shepard, in an unusual relationship for that time. The emotions in the illustrations came from the inkwell of his heart and observations of real-life, but Milne also had a hand in matters. He expressed how he envisioned the stories and characters. Drawings evolved in conversations over tea and lunch, in letters between the two men, at the Milne home on Mallord Street in London, and, of course, on a visit to Hartfield. Unlike Picasso, who said, “I draw not what I see but what I think,” Shepard drew from real life. In fact, his visual memory was so acute that he could re-create on paper events and people he remembered from years earlier. Knowing how Ashdown Forest inspired the stories and setting Milne created, Shepard visited and sketched Ashdown Forest in 1926, the two men walking to Poohsticks Bridge, Gills Lap, and elsewhere. The bee tree, Wol’s tree, Galleons Lap, and the Enchanted Place were real places Shepard interpreted with a notebook, pen, and pencil in hand. He wanted to capture a tangible sense of place to set the adventures. He sketched pine trees and heathland and watched Christopher Robin making mud pies with Graham, Shepard’s son, in the gardens at Cotchford Farm. Shepard’s masterful illustrations were tenderly drawn from real life. He enhanced Milne’s characters – their dialogue, manner, and adventures – to capture the charm Milne put in words. All the creatures were drawn from Christopher Robin’s own stuffed animals except for one: Winnie-the-Pooh. This characterization was inspired by Growler, a teddy bear belonging to Shepard’s son. Years later, Shepard recalled telling Milne, rather sheepishly, how Growler lost a fight with a dog in a Montreal garden. Perhaps they commiserated. Perhaps Milne felt relief. He, too, had a secret. Roo, he revealed, had met a similar fate in the jaws of a dog in a nearby orchard. After writing about the history of the two creators and their collaboration, the author talks about the places – actual and imaginary – from the books. This is the part that makes me want to go back to Ashdown Forest. She found the origins or inspiration for nearly all the places in the book. Yes, some of them I definitely remember visiting with my family, but I will bring this guidebook if I ever go again and find the places I missed. I will also plan more than one afternoon to spend there. She makes a strong case that the best way to explore A. A. Milne’s natural world is by walking, and there are an abundance of walking paths in Ashdown Forest. We also would have done well with the tip to bring our own sticks to the Poohsticks bridge! There aren’t many to be found at the site where Christopher Robin played the traditional game – though we did see lots of sticks downriver! In the one site she mentions apart from Ashdown Forest area, the author and her family went to the 2014 World Poohsticks Championship in Oxfordshire. The third section of the book tells, fittingly, about the natural world of Ashdown Forest, its history and the flora and fauna found there. Though the Hundred Acre Wood is imaginary, you can still see it in the gorse, heather, and Scots pines of Ashdown Forest, which lives on and changes slowly over time. Milne’s classic stories also live on, showing no signs of abating in the hearts and minds of readers around the world. What many are not aware of, however, is how much history is present in this ancient landscape, shaped as it was (and is) by kings, commoners, and conservators. The forest has a story of its own – one that began long before Milne’s characters ambled in and became a part of it. With this three-pronged approach – Milne’s life, the book places, and the history of the forest – the book feels a little repetitive. Poohsticks, for example, are mentioned more than once in each section. The author uses the least excuse to quote from Winnie-the-Pooh, which is certainly forgivable, though wasn’t always necessary (at least for this reader, who pretty much has it memorized myself). In the section about the flora and fauna, there were many photos, but they didn’t always match up to what was mentioned, though that may just be a layout issue. Overall, this is a wonderful book that makes you want to go immediately to Ashdown Forest and spend a few weeks with the spirit of a boy and a bear playing in the Enchanted Place at the top of the forest. I wish we’d had this book before we visited, and now I must go again some day. Anyone in my family, be alerted: There is a place called The Hatch Inn in the neighborhood, where William Butler Yeats and Ezra Pound used to hang out. (My family name is Hatch.) If I had known this existed, I would have made sure to visit that as well. How does the story continue between Christopher Robin and Pooh bear? That is a narrative left to our imaginations. But we can return to that place, the Hundred Acre Wood, with its honey trees and sandy pits, rabbit holes and tree houses. It is not merely a fabled literary landscape that exists only in our minds. It is Ashdown Forest, a living landscape where Milne walked for decades and which inspired him to set these stories. You and I can visit it today. And if you and I can visit those enchanting places in more than our imaginations, is that time of our lives truly gone?